Ready for some fun in the sun? 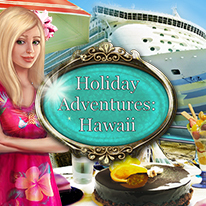 In Holiday Adventures: Hawaii, enjoy the adventures of three long time friends, all with different personalities. Years ago, they promised to themselves, however their life would work out, they would find the time to go together somewhere. This time they visit Hawaiian Inslands. Enjoy searching for items in colorful exotic locations. Different game modes, cleverly hidden objects and increasing difficulty will make your adventure nice, relaxing and challenging. - Different play modes: Picture, Silhouette, Word, etc.